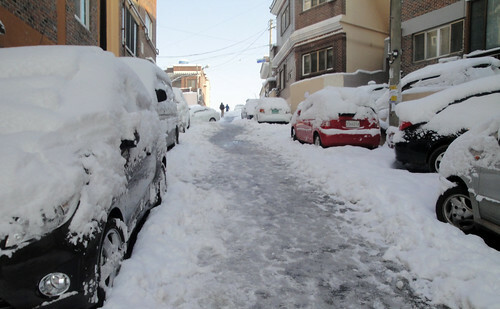 When I first arrived in Korea, everyone kept telling me how it “never snowed in Ulsan” and how jealous they were that I was from Michigan where it got so much snow. ha! 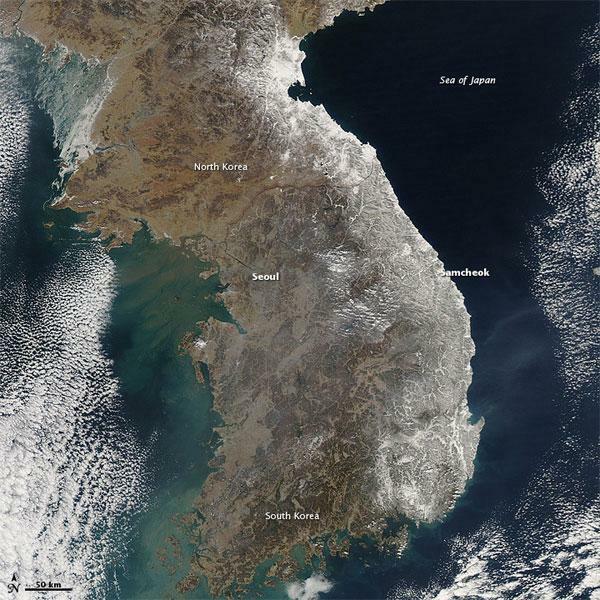 This winter has been one of the snowiest and coldest in Korea’s history, at least since they started keeping records. 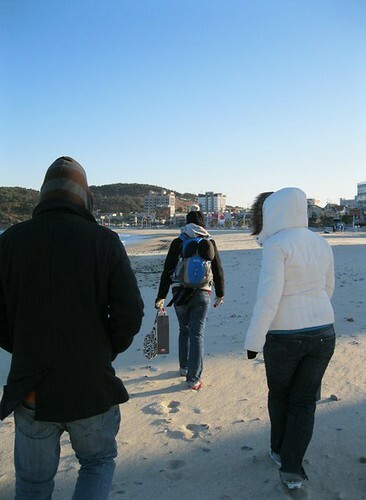 On one of these coldest of days, I decided it would be a good idea to take some visiting friends to the ocean. We knew it was cold, but we didn’t know quite how cold it was. Afterwords I learned it was -17 Celsius, which I had to convert on my computer to see that means it was 1 degree Fahrenheit – pretty cold! So being on the windy oceanfront was definitely the best idea. I actually kind of like beaches in winter, but this was a bit too cold. 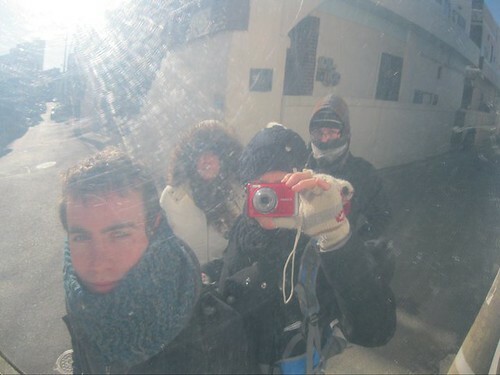 Please note how bundled up we are. It didn’t do any good. 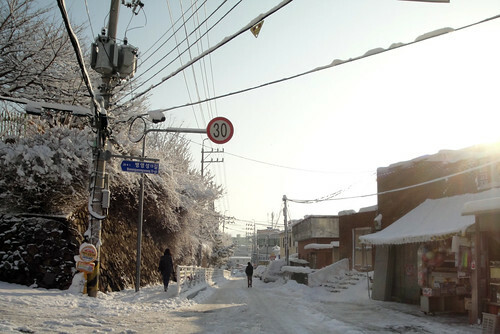 Luckily down in Ulsan the snow wasn’t that bad, but just meant I got out of school a couple hours early. I was struck by the strongest urge to make a snowman, especially since my friend Shannon from Georgia had never been around enough snow to make a ‘real’ snowman before. 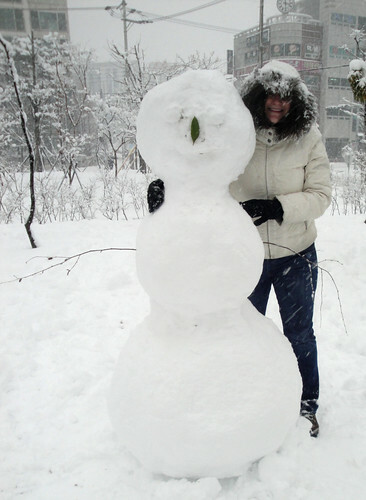 Snowmen in Korea are usually only made with two snowballs, one for a body and one for a head. So we were certain to make an American-style snowman, which I realized I hadn’t done for probably 10 or 15 years or something like that. 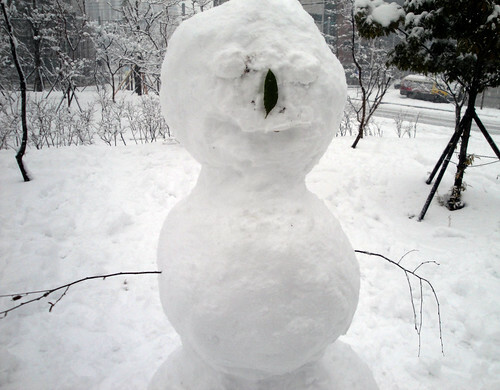 Ultimately I think our proportions were a bit off, and it was rather unfortunate that we couldn’t find anything for the eyes or nose, but it just felt so satisfying to make a snowman I didn’t really care. 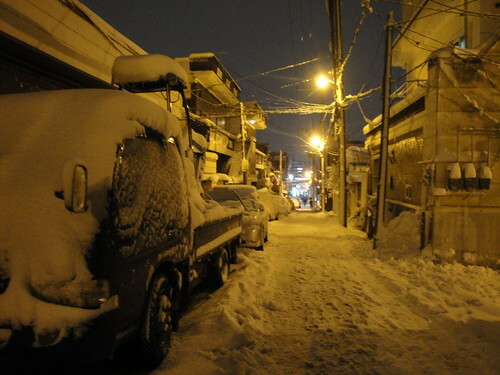 By nightfall, it still hadn’t stopped snowing. Ultimately, it snowed for something like 12-14 hours. I’d guess somewhere between 7 and 10 inches accumulated. The next morning I awake to find it had finally stopped snowing, but now the roads were of course sheer ice. Which made my walk to school rather treacherous.